Well hello there! Welcome to another laser rangefinder review. 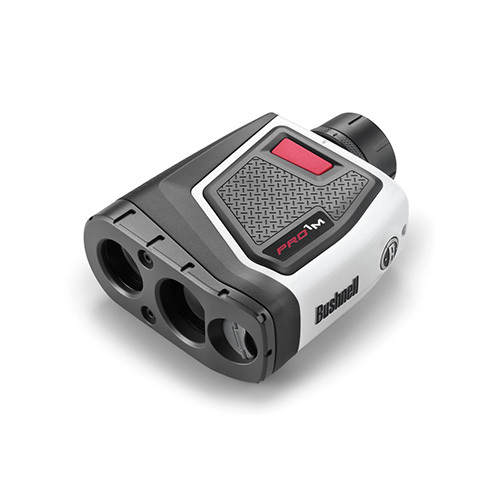 This time around, we’re evaluating Bushnell’s Pro 1M Tournament Edition, a golfing laser rangefinder that has potential to be great for rifle shooters and bowhunters alike. Bushnell is known for making some great products, so let’s see how well this one stacks up against the competition. As the “1M” indicates, this laser rangefinder has a maximum range of one mile (1,760 yards). Naturally, you won’t be able to range deer from that far away; expect to get a good readout on a smaller, less reflective target like a deer or moose from as far away as 600 yards. To bring the target closer to you, this rangefinder offers 7X magnification. Accuracy is within half a yard, which is very good considering the long range of the device. How Easy is the Pro 1M to Use? Our hands are sometimes notoriously unsteady, and a horizontally oriented rangefinder is easier to keep still. It’s unfortunate that such a design is being phased out, but Bushnell has brought it back with the Pro lineup of laser rangefinders. This particular model, while a bit on the heavy side, is definitely easier to hold steady to get that perfect lock-on to your target. The display is clear and easy to read, and it’s slightly tinted to reduce glare. The Vivid Display Technology (VDT) provides your LCD readout in red instead of the usual black, making it much easier to read in low lighting conditions than most rangefinders offer. The Bushnell Pro 1M Tournament Edition gives you fully multicoated optics and a 26mm objective lens. This device’s field of view is a very generous 340 feet from 1,000 yards, allowing you plenty of room to look around and find your target. The eye relief on the Pro 1M is a comfortable 19mm. You’ll be able to do some diopter adjustment on the Pro 1M, but only plus or minus two diopters. I get so tired of saying this, but I have to. Rangefinder manufacturers seriously need to quit using CR2 and CR123 lithium batteries. Bushnell uses the 3-volt CR123 lithium battery in the Pro 1M Tournament Edition, but at least one is included in the box. I recommend buying a spare, since these can be difficult to find in the bush. This rangefinder is dishearteningly lacking in features for hunters, since it was designed with the golf course in mind. The device’s pinseeker mode is on by default, and there’s no way to turn it off. This means you can’t pan across multiple targets very easily to get different ranges. This particular mode is meant to identify the closest object within the reticle, ignoring background objects, such as trees, even though they may be larger and have stronger reflective characteristics. A very much appreciated feature, though, is the red illumination of the readout with the VDT. The illumination can be set to different intensities, making the rangefinder a cinch to use even during twilight or dusk hours. What’s the Light Gathering Capability Like on the Bushnell Pro 1M Tournament Edition? How Are the Optics and Focus on This Rangefinder? Optics and focus are above-par by a great deal, thanks to Bushnell’s exacting engineering and the use of quality coatings. Focus is fast and snappy, giving you a sharp image with astonishing speed. The Pro 1M Tournament Edition feels very durable and sturdy in your hands, and that feeling is backed by a two-year warranty. The optics chamber has been nitrogen-purged, and the lenses are sealed with O-rings. This makes the device both fogproof and waterproof. The rubber armor coating helps to absorb shocks if you should drop the rangefinder. Thanks for reading my review of the Bushnell Pro 1M Tournament Edition laser rangefinder. While this tool has limited functionality for the hunter, it’s still worth considering because of its exceptional range, accuracy, and the red VDT readout. Unfortunately, it’s a pricy investment and fairly heavy.